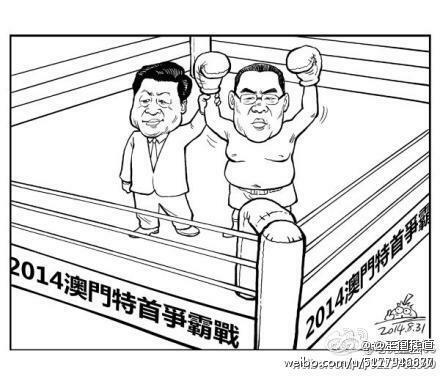 A roundup of online political cartoons and Weibo comments on Beijing’s August 31 announcement of rules for Hong Kong’s 2017 election of chief executive, and Macau’s “election” of chief executive during the same weekend. In this Rebel Pepper cartoon, a Chinese official (who bears a resemblance to President Xi Jinping) holds two red puppets up from behind the controls of his tank, beckoning an Occupy Central activist to choose between the identical candidates: “Come, choose one. But, choose wisely.” The character for “Party” (党) is barely visible behind stickers reading “Democratic Faction” (民主派). In the background, Taiwanese President Ma Ying-jeou and Taiwan’s Democratic Progressive Party (DPP) Chair Tsai Ing-wen shield themselves from encroaching mainland influence with a DPP flag. President Ma Ying-jeou has publicly offered his support for universal suffrage in Hong Kong, and ties between activists from HK and Taiwan have recently been gaining strength. As Beijing was preparing to deliver its decision on Hong Kong, an election was underway in Macau for the similarly semi-autonomous region’s chief executive. Incumbent Fernando Chui won, hands down, garnering 380 of 396 votes cast by the region’s election committee—an unsurprising feat considering he was the sole candidate running. Following the lead of Hong Kong activists, Macau held an unofficial referendum on democracy last week after the arrests of organizing activists delayed the poll earlier this summer. The results showed that 89% of the 9,000 participants have little trust in their recently re-elected chief executive. 马志尼: A: Wanna hear a joke? B: Sure. A: Macau had an election. B: Ha ha ha ha ha ha! 滴墨渐成殇2: Macau elected its chief executive this morning, and the sole candidate, Fernando Chui, won another term in office by a landslide. Ten or so people knelt in the street to protest the election as undemocratic. Only by using fear to create servility were they able to hold this illegal [election]. So they knelt in Macau just like they knelt in the enemy-occupied territory [Hong Kong]. You who should be your own masters: when you kneel, you have already lost the courage to disdain them. When I saw this, all I could think was: Macau has already fallen to the enemy.